Preview Days for the 2019-2020 school year will be announced soon. Prospective students and families are welcome to tour Blinn's five campuses year-round to learn more about our facilities and program offerings. Please click here to register for a campus tour. Are you considering the Blinn College District? Would you like to find out more about one of the nation’s most affordable colleges, with tuition and fees about one-third the cost of most public four-year institutions? Do you want to learn why Blinn is one of the top community colleges in the state of Texas and recognized for our high transfer rate? 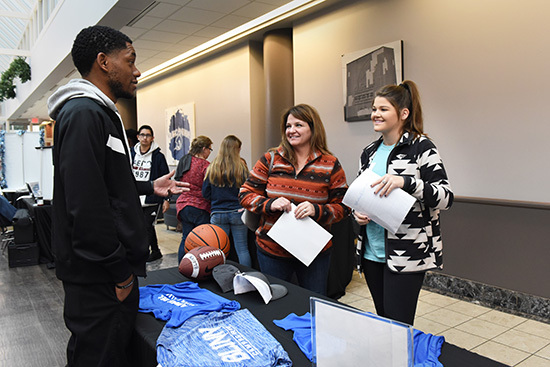 Preview Day is a great way to learn more about what Blinn has to offer, whether you want to enter quickly but effectively into a career, or you want to eventually earn a bachelor’s degree. These fun-filled days feature information sessions about the admissions process, enrollment services, financial aid, housing, and student life. Prospective students and their families are invited to tour campus, view dorms and apartments on the Brenham Campus, and participate in a departmental fair, where students can speak with representatives from various Blinn departments and organizations.